Little is known about this vase. It was photographed while in the collection of the late John Britt and measures 8 inches tall with a 3 1/4-inch base. It has been identified as a Josef Rindskopf piece, but then the message below from Paul Kirk arrived so there is some doubt now. 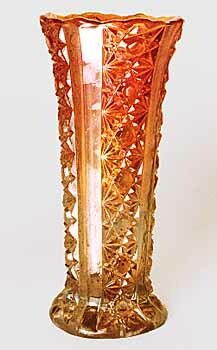 I do not know the origin of this particular vase, but can tell you that the pattern is Duncan's Clover, introduced, I believe around 1905. 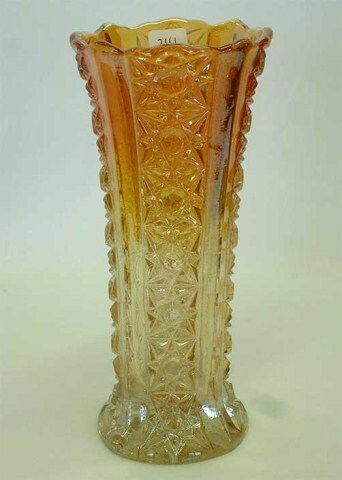 Probably another instance of American patterns that were copied by European companies in iridized glass. 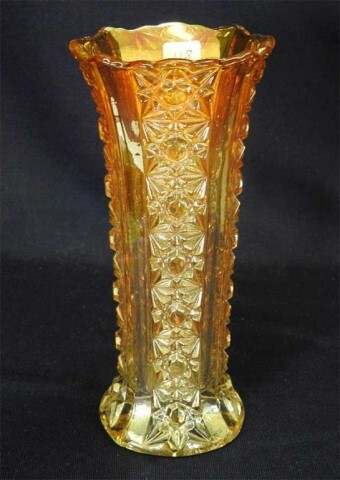 In 2007, two marigold vases listed as Cane Panels sold for $130 and $200, respectively.